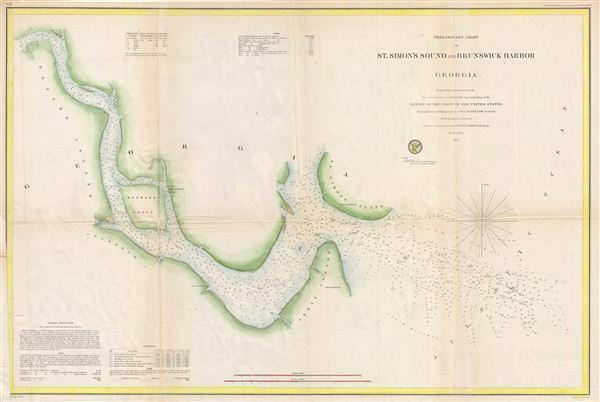 Preliminary Chart of St. Simon's Sound and Brunswick Harbor Georgia. An uncommon 1857 U.S. Coast Survey nautical chart or maritime map of Brunswick Harbor and St. Simon's Sound, Georgia. The map covers from Blythe Island past Brunswick and Buzzard Roost to St. Simon's Island and Jekyl Island. Issued on a scale of 1:40000. The triangulation for this chart is the work of A. W. Longfellow. The hydrography was accomplished by a team under the command of S. D. Trenchard. The whole was compiled under the supervision of A. D. Bache, one of the most influential Superintendents in the history of the Coast Survey. Published in the 1857 edition of the Superintendent's Report. Bache, A. D., Report of the Superintendent of the United States Coast Survey, Washington, 1857. Good. Map exhibits typical wear, verso reinforcement, repair, and toning along original fold lines. Blank on verso. Margin extension lower left corner.